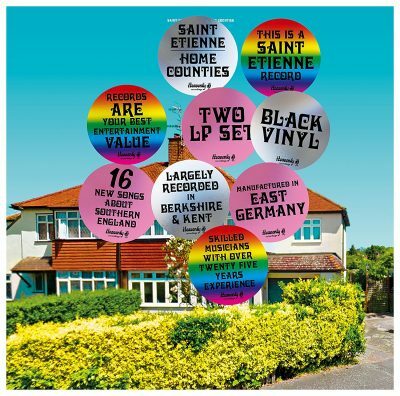 2012’s Words and Music by Saint Etienne remains on a fairly constant rotation in my music library. Much like its antecessor, 2005’s luminous Tales From Turnpike House, it was likewise full of hooks, irresistible beats, pure pop and balladry—it was a concept album of sorts (the theme being music and music collecting and how it affects one’s life) and has held up well in its relatively short life. Never ones to sit on their laurels in the interim between albums (releasing books about music, film scores and solo projects), it is always anticipation mixed with fascination to learn new music is forthcoming from this British trio, which was joyously announced in late March. This brings us to Home Counties, or, what Bob, Pete and Sarah (Stanley, Wiggs and Cracknell, respectively) did next. While not specifically a direct concept album like its two predecessors precisely—despite there being a recurring theme of suburbia and suburban life—the band has taken some inspiration from their luminous back-catalog and reinvested it into their always stellar songcraft skills. Home Counties‘ 19 cuts are really 16 solid songs—including some gorgeous choral/instrumental interludes (“Church Pew Furniture Restorer,” “Breakneck Hill” and “Angel of Woodhatch,”) and the three others a return to the random sampling from their early days (“The Reunion,” “Popmaster” and “Sports Report”) that will delight their longtime fans. Co-producer Shawn Lee (Wall of Sound, Young Gun Silver Fox) seems attuned to this and helps to polish the album’s many highlights and varied styles to a subtly splendid sheen. And speaking of those, opener “Something New” shimmers as soon as Cracknell’s lovely vocals start. It is like hearing from a dear old friend. Next, the drums start for the album’s absolute kickass vibe, the anthemic “Dive.” As the sambas kick in with the bass, the song’s shimmery elegance—and the imagery it instantly conjures—are immediate. It is water, it is summer, it is unabashed and Latin-tinged and irresistible. Overfilled with pure joie de vivre—like someone whispering conspiratorially in one’s ear—Cracknell’s voice beckons you to the dance floor. It is an absolute album thrill and hopefully a future single, if not even just a remix. If “Dive” were the pinnacle of this collection’s songs, it would be enough, but being expert songsmiths, there are many more surprises and goodness ahead. After the beauty of the choral-blessed “Church Pew Furniture Restorer,” along comes the wistful “Take It All In.” “It doesn’t matter where you’ve come from / It doesn’t matter where you’ve been / I’ve no interest at all in bygones / Or the spaces inbetween,” Cracknell advises, while a soft, cinematic score plays around her. Akin in wisdom and catchiness is the upbeat “Underneath the Apple Tree,” which further boasts an organic bass line, drum claps and even horns. Synths and looped male background vocals (and those are always a nice complement for Cracknell’s voice) return for the impossibly tuneful “Out Of My Mind.” Dreamy waves of pop accentuate the lyrics and the at times filtered vocals beautifully. As a counterpoint of sorts, the languidly reflective “After Hebden” finds Cracknell requesting to “turn the news off / I feel old,” alongside the tune’s gentle backbeat, pretty keys and her always lovely cooing. Ominous, spectral-like voices announce the sinister “Heather,” which is wickedly good. Piercing synths punctuate the intriguing lyrics (“I’m bruised black and blue tonight”) and the repeated “this house is haunted,” to chilling effect. This would again make a great single release, and like “Dive,” seems custom-made for remixing. Changing gears again, the grand rollicking of “Train Drivers In Eyeliner” conjures up a ‘70s nostalgia musically, but its lyrics are clearly of today. Ever the musicologists, this tune nods to both Gene Vincent and his classic “Baby Blue” and Whitesnake‘s “Fool For Your Loving” respectively, and its waggish hook is brilliantly memorable. Speaking of which, Cracknell’s lovely voice really shines on the fanciful “Unopened Fan Mail.” By turns heartbreaking and humorous, it could arguably be a sequel of sorts to Good Humor‘s “The Bad Photographer.” Strings and another gorgeous vocal performance highlight “What Kind Of World,” even while its sad narrative questions modern life’s hectic reality. (“This is our story / Let’s get it right / This is our home / But I don’t feel at home tonight.”) The lengthy and mostly spoken word epic “Sweet Arcadia” namechecks both well-known and forgotten English towns and estates as lists (perhaps as a nod to their debut, Foxbase Alpha), and even the simplicity of the materials used to build them. Woodwind instrumentation and birdsong back her poetry until the song’s interlude, and then Cracknell’s pretty singing returns briefly for its final refrains. Five years between albums can sometimes feel like a lifetime. But with the quality and craft put into this new album, clearly the wait has been worth it. Home Counties is not just simply what Stanley, Wiggs and Cracknell did next—it is also “how” they did it. Like their very best work, the thrill is in the discovery and exploration of its 19 tracks, from not only their musical content, lyrics and arrangements, but even how they are sequenced. The album also boasts great artwork from the notable Scott King.